Whether it’s traversing tranquil landscapes or striking up conversations with strangers, that laidback yet adventurous caravanning lifestyle has it all. Which is exactly why Brian Paxton and wife, Kathy, have been at it for the last 20 years. The couple are caravanning veterans, and have long, indulged in its joys, with camping and fishing adding especially to Brian’s life. It is also how he winds down after a tough week at work. “As the underground drill maintenance supervisor at work, I often do long 12-hour shifts, so caravanning and camping is my way to relax and unwind. I’ve had memorable experiences meeting some great people and seeing a lot of the country along the way,” Brian shared. 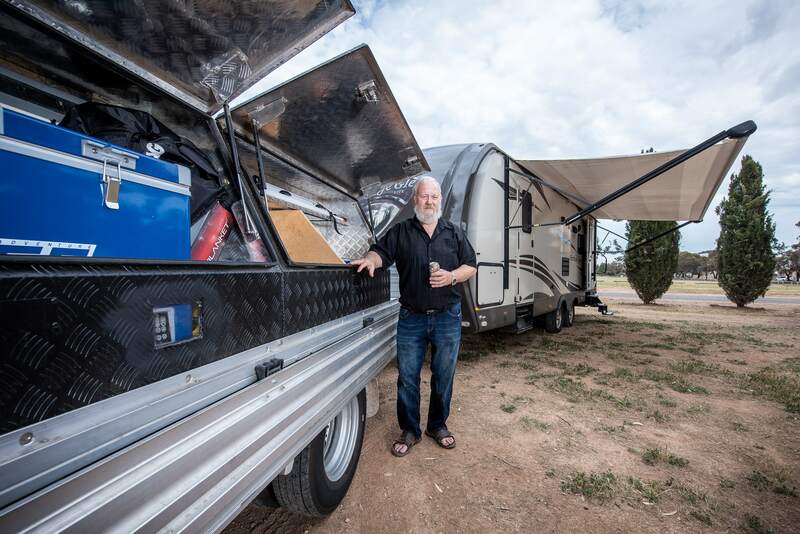 Kicking his caravanning passion into full gear, Brian and Kathy have decided to go on the road for the next four years, travelling across Australia. 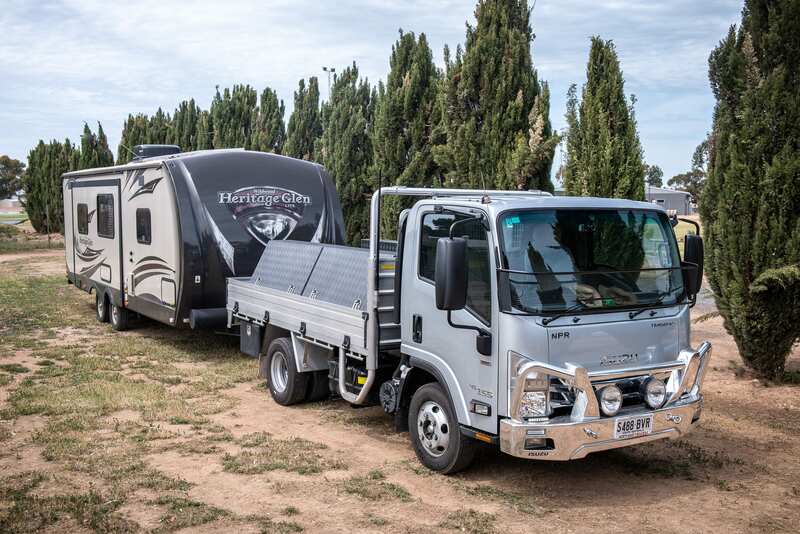 And wheeling their dreams to reality is their new Isuzu NPR 45-155 Premium SWB Tradepack, effortlessly towing their caravan to the destinations of their choice. Prior to their new purchase, Brian’s old four-wheel drive was burdened with the heavy task of towing their 26-foot caravan, and the upgrade to a truck became necessary. But what swayed them towards choosing an Isuzu truck to be part of their adventures? 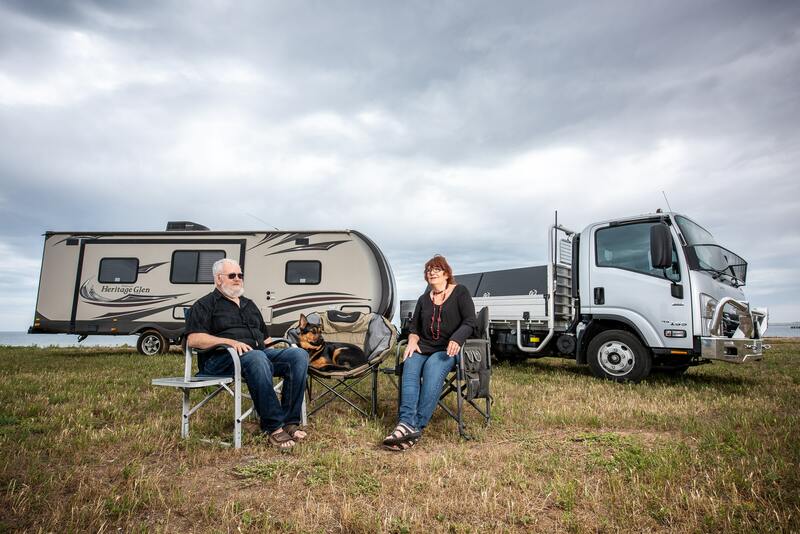 Living in Kadina, South Australia, Brian and Kathy use their Isuzu Tradepack for more than their caravanning trips. The couple admit to using the truck like a car, sometimes to make the local supermarket run. “It’s so easy to drive the truck that we take it to the supermarket too. “And Kathy doesn’t even need a special truck driver’s license for it; she can still tow the caravan on it with her car licence, which adds to the convenience,” Brian said. In preparation for their off-road adventures, Brian has made sure that the truck is kitted out with the best accessories. For added safety the fully fitted truck has a citizen band radio, as well as running lights that also reduces usage of headlights. The back has also been equipped with four tool boxes, accommodating a fridge, repair tools, an extra fuel tank and batteries. “We have even added a box for all our firewood and related supplies. All we have to do is drop the tailgate on the left-hand side, open up the boxes, and everything is easily accessible,” Brian said. With a gross vehicle mass of 4,500 kg, power of 114 kW @ 2,600 rpm and torque of 419 Nm @ 1,600–2,600 rpm, the Isuzu NPR 45-155 Premium SWB Tradepack certainly packs a lot in its compact frame. But not only is the truck a powerhouse, it is also great for long commutes and ensures a comfortable drive. While Isuzu trucks have a leading reputation for reliability that Brian can happily attest to, the great comfort and driveability of his Tradepack is what has him grinning from ear to ear. “The seats are very comfortable, and we’ve even got great covers for them. “I’ve got great vision out the front when I’m on the road because I’m seated a bit higher, which is a welcome change from driving my four-wheel drive. “The turning circle on this small wheelbase truck is just fantastic. It’s better than a four-wheel drive because I can actually turn the truck around sharper on a narrower road, which is a real bonus for us,” he explained. For Brian and Kathy, what really sealed the deal is knowing that they can rely on Isuzu’s efficient and accessible servicing at any time, especially when on their travels. “As we are going to be on the road for at least a few years, Isuzu’s large presence with depots all across the country is quite reassuring, not to mention their product support. “This lets me know that we are taken care of,” Brian said. Overall, Brian is really pleased with their new truck, which is already his favourite transport. And as he explained, their new truck will save them from plenty of headaches, especially when travelling to eastern states. “An overweight car can lead to a $1,500–$2,000 fine. But that’s something we don’t have to worry about anymore since we’ve gone for a 4.5-tonne truck that tows a 3,500 kg van. “Isuzu’s really got it right for us caravanners,” Brian exclaimed. And now that they have their house-on-wheels sorted, where to next for the caravanners? Brian said, “We’ll be heading to New South Wales, visiting our daughter. “We’ve got children living in different parts of Australia, so when we retire, we’ll have to drive between those places.